The Hertz Corporation has announced that New York will be the first city to receive electric vehicles (EV) as part company's Hertz Global EV initiative with cars also being delivered to Washington DC and San Francisco. Beginning Today Hertz will make next generation of electric vehicles available to the general public through its Connect by Hertz car sharing operation and, starting today, local area residents and visitors can go to www.hertzev.com to sign up to be among the first to try an EV such as the smart Electric Drive and Nissan LEAF. "Hertz is the first to provide consumers with electric vehicle access on a global scale," commented Mark P. Frissora, Chairman and Chief Executive Officer. "By introducing EVs in New York, Washington and San Francisco, we're the first to make tomorrow's driving experience available to consumers today and we look forward to continue building out our EV platform, making electric mobility a reality for consumers worldwide." Hertz will add hundreds of EVs to the Hertz fleet over the coming months making electric vehicles available at locations in Manhattan, Washington DC and San Francisco. 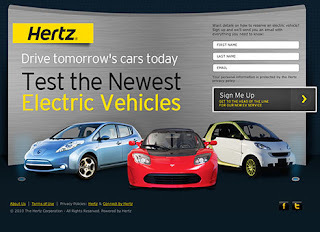 To book an available EV, consumers must sign up for Connect by Hertz membership and make a reservation via connectbyhertz.com. As an extra incentive, those that sign up on www.hertzev.com, between today and December 25, 2010 will receive a one-year free membership in Connect By Hertz. "Electric vehicles and car sharing help meet two fundamental PlaNYC goals, making New York a cleaner and less congested city. Through Hertz Connect New Yorkers will have the opportunity to be among the first to try an electric vehicle, and more choices of how to get around if they don't own a car of their own," commented David Bragdon, Director of the Office of Long-Term Planning and Sustainability for New York City. While New York, Washington DC and San Francisco, will be the first U.S. Connect By Hertz cities to receive electric vehicles and plug-in hybrid electric vehicles, Hertz plans full-scale deployment of EVs and PHEVs in both the U.S. and other countries throughout 2011. As the world's largest general-use airport car-rental brand, Hertz is uniquely positioned to introduce multiple groups of consumers -- urban drivers, university students, travelers and corporations -- to all-electric and plug-in hybrid vehicles. As part of its strategy, Hertz is forming partnerships with manufacturers, charging station providers, municipalities, NGO's, corporations and other stakeholders. To-date, the company has: ordered vehicles from Nissan, GM, Toyota, smartUSA, and Mitsubishi and has signed an agreement with NRG Energy Inc. to support development of a charging infrastructure and services for electric vehicles (EV) in Texas.